Pus. Pus or cloudy fluid is draining from the wound. Pimple. A pimple or yellow crust has formed on the wound. Soft Scab. The scab has increased in size. Red Area. Increasing redness occurs around the wound. Red Streak. A red streak is spreading from the wound toward the heart. More Pain. The wound has become very tender. More Swelling. Pain or swelling is increasing 48 hours after the wound occurred. Swollen Node. The lymph node draining that area of skin may become large and tender. The wound hasn't healed within 10 days after the injury. Some pink or red skin on the edge of the wound is normal. It's more common if the wound is sutured. It's also normal for it to be swollen for a few days. Your child's wound is not infected unless the redness spreads or pain increases. For any redness or other signs of early infection, use heat. Open Cuts or Scrapes. Soak it in warm water. You can also put a warm wet cloth on the wound. Do this for 10 minutes 3 times per day. Use a warm saltwater solution. You can make your own. Put 2 teaspoons (10 mL) of table salt in a quart (liter) of warm water. Closed or Sutured Cuts. Put a heating pad on the wound. You can also use a warm, moist washcloth. Do this for 10 minutes 3 times per day. Cautions for Sutured Wounds. Do not put anything wet on the wound for first 24 hours. After 24 hours, can take brief showers. Never soak the wound before all sutures are removed. 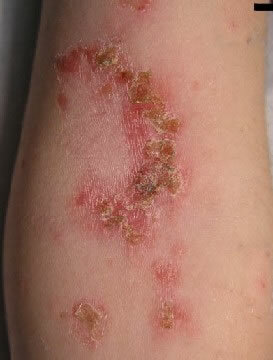 Use an antibiotic ointment (such as Polysporin). Put it on the wound 3 times a day. If the area could become dirty, cover with a bandage (such as Band-Aid). Pain and swelling normally peak on day 2. Any redness should go away by day 4. Complete healing should occur by day 10. For true wound infections, your child can return after the fever is gone. Your child should also be taking an antibiotic by mouth for 24 hours. For minor redness around the wound, your child does not need to stay home. There is a pimple where a stitch comes through the skin. The pimple suggests a low-grade infection. If you look closely at this photo, you should be able to see a red streak (lymphangitis) spreading from the hand wound up into the arm. The presence of lymphangitis means that there is an infection that needs urgent antibiotic treatment. Admission to the hospital is sometimes required.